Service Costs > How Much Does a Shoe Shine Cost? How Much Does a Shoe Shine Cost? A shoe shine is the process of cleaning shoes using a variety of cleaning products designed to clean your shoes. 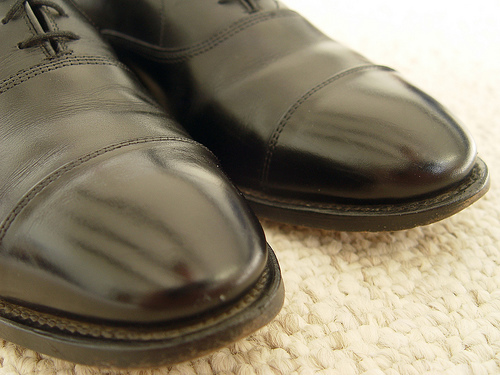 If your shoes are losing its shine and new look, a professional shoe shine may make the world of a difference. On average, a shoe shine is going to cost anywhere from $5 to $12 without the tip, and the cost will depend on the shoe shine service, type of shoe being shined and type of service chosen. At the airport, where you commonly find a shoe shine stand, the average price, at least according to our research, was about $6 to $11, not including the tip. USShoeShine.com, a shoe shine service located in the Washington D.C. area, provides leather services and repair, for $7 to $12. For example, if you want to have them apply a Meltonian cream on the shoe, the service can cost $8 to $10. Shoes made of suede can cost $10 to $15. According to a few members on the AskAndyAboutClothes.com thread, they had paid anywhere from $2 to $5, plus a tip, which is usually another $2 to $4. Nordstrom, the popular department store chain, often has a shoe shine stand inside its stores. According to those who have had their shoes shined here, the costs were often in the $2.50 range, depending on the geographical location. During most professional shoe shining jobs, your shoes will be dusted, followed by a chemical applied to the shoe. It is then buffed and shined. A shoe shine service is often done with shoes made of leather. The average in-chair shine can take five to 10 minutes, depending on the level of shine required. Aside from your typical leather shoes, professionals are also able to shine, clean or care for nubuck, exotic leathers, stain, canvas, suede and rubber. In the estimates mentioned above, the cleaning materials and the labor should be included. Depending on the type of cleaning the shoe needs, the price can go up. For instance, a shoe made of suede could cost more than one made of leather. Some stores can offer pickup and delivery service for an additional fee. Some services may also be able to repair your shoe for a minimal fee as well; however, if a repair is required, it will need to be done offsite due to the time restraints. A tip is often expected, usually around 10 to 20 percent of the total. Professionals who shine shoes can often shine more than a shoe. Ashineandco.com, for instance, will clean, condition and restore anything made of leather, including a purse, luggage, jacket, wallet and briefcase. Esquire has a fun article telling you 13 things you shouldn’t say to your shoe shine person. The best way to save on costs is simply by purchasing a simple shoe shine kit from a store and clean them yourself.